A thread for all things Nintendo 64. I no longer own one as I foolishly sold a mint JP machine with 50 games. However I have been playing Wave Race recently via the Wii and it is still fantastic. Re: The Nintendo 64 thread. I didn't get an N64 until waaaay after they were commercially active - about 4 or 5 years ago, I think. It will be hard for some of you proper gamers to imagine, but I wasn't actually even aware of the existence of the N64 - I spent much of my time in the late 90s playing Colonization to death on my Amiga 1200. Yes, late 90s - I didn't even get a PC until 1997. I remember spending quite a long time trotting around in Donkey Kong 64 - I thought it was quite good fun, really. I liked being able to wander around aimlessly. But the game I enjoyed most of all was Conker's Bad Fur Day. I think I have about 40-odd cartridges that I've collected for the machine, many of which I have hardly played. Disgraceful, isn't it? Myself and 3 friends at the time all bought used N64's just for Perfect Dark, we were hooked by that game, even though system struggled to cope with it's demands, frame rate wise. Once the novelty of P.Dark wore off (and i soon tired of the HD remake on 360), i picked up a good few N64 games:Lylat Wars took me a while to get into, but was fantastic, Doom was decent enough, but picture was too damn dark, loved Quake 2, Banjo-K, could'nt get on with Jet Force Gem (still have my copy), Body Harvest or Command And Conq. on N64 (awful controls with that damn ang.stick), Mario 64 (not my thing at all), Goldeneye was good, but man hard on the eyes with that A.A, always looked like picture was out of focus and wandering aimlessly around the artic level got very tiresome, 50 shades of white!. Couple games i always wanted to try were Hybrid Heaven and more so Battlezone (loved the 2 PC games by pandemic) were they any good?. Couple of other N64 games i got to play on DC (not sure if this counts) Rayman 2-Gorgeous and joy to play and Shadowman, aimless wandering galore, might have been huge game, but man was it dull. The N64 was the first console I bought in 1998 when I was 13. It's the only time I've owned a console when it was still "current". I somehow managed to sidestep the whole PS1 thing as I wasn't as console gamer beforehand. I got an N64 because I just happened to have friends who all had one. The first time I played it I was rather bemused by it. The controller was very alien to me and I didn't "get" it for a long time. But the multiplayer aspect of it in particular really captured me. After I got one it wasn't long before I was making people quit Goldeneye matches. Some of my favourites would be: Goldeneye, Diddy Kong Racing, Perfect Dark, Banjo-Kazooie, F-Zero X, Turok: Rage Wars, 1080 Snowboarding, Space Station Silicon Valley, Rogue Squadron, Snowboard Kids, Super Mario 64, Ocarina of Time. I bought an N64 off ebay a few years ago - the translucent 'Jungle green' DK64 one. Despite having bought most of the supposed 'classics' to play on it I can't escape the conclusion it was/is a truly woeful games console with an appalling controller. Ninty really dropped the ball with the N64. There are a couple of games I enjoy playing on it though which is why I've kept hold of it. The main one being Robotron 64. The machine was certainly riddled with poor choices. They should never have forsaken a CD drive for a start, that cost them Squaresoft and real EA support, like or hate them, big hitters help a machine. No RGB support as standard was utterly stupid also given the machines fairly muddy output. 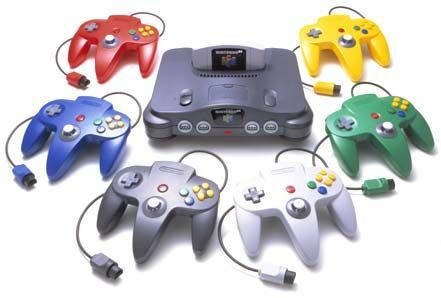 Looking back on the N64, it gave hours of multiplayer fun with some ace single player games too. Goldeneye is such a stone cold classic and I have really been craving it lately. Probably won't be like old times though. Been playing a little Doom 64 too and that is ace. Super smooth and visually still very nice. Love F-Zero and need to unlock that X cup again. Pretty cool Vyo! I like the Crusi'n games. Steering wheel works well with those games. Cruis'n the World is my favorite. Other favorites are Diddy Kong Racing, Excitebike 64, Mario Kart, Micro Mchines, Midway Greatest Hits, Namco Museum, NASCAR '99, Pokemon Stadium I & II, Scooby Doo, SpiderMan, Star Wars Episode I: Battle for Naboo & Rogue Squadron, Tony Hawk Pro Skater II and the WCW/WWF games are good. I was disappointed with Batman Beyond, Road Rash and Transformers: Beast Wars. I found the N64 through emulation, and picked up a console because I liked the games I'd been playing. My favourites ar Waverace64 which is just great fun for a quick blast to while away some time, MarioKart64 again good fun and SuperMario64. Like most though I still don't "get" the controller. I got the controller - it's been bettered of course since but I still find it perfectly serviceable. Given the pathetic attempt Sony made of a controller at the start (remember version 1 had no analogue sticks) I think people do the N64 controller a disservice when they slag it off. Mario 64 was/is great and can't see how it or Zelda OOT could have been done as well if they hadn't been cartridge based - the media at the time just wouldn't have been up to it - the seamless transition that cartridge loading gives you made those games. F-Zero X is a favourite - I dodged Waverace as I read the PAL version is abysmal. Mario Kart was a bit of let down for me - but I've since seen it as a pretty good multi-player game - a lonely experience in 1 player though. I had a lot fun with the console and some games still look pretty good provided you don't use composite hook up. Rayman 2, Virtual Pool64, Doom64 and Res Evil 2 still look excellent today as far as I'm concerned. Mischief Makers, Mystical Ninja 2, Mario Tennis, Pokemon Puzzle League, 1080, Wetrix, Banjo Kazooie - all great stuff still well worth a look. It was four player out of the box too - Bust-a-move 3 and New Tetris takes full advantage of that (great Neil Voss tunes in New Tetris) - as does Mario Tennis and plenty of others. Lot of junk for it too and I'm glad I never paid full price for any turkeys. The blurry graphics mean its aged pretty badly but use RGB or s-video and it clears up quite a bit and the better games have aged quite well. A few real odd-ball games to look out for too - Pokemon Snap, Fighters Destiny, Spacestation Siicon Valley and Blast Corps all have something a bit different though some look a bit rough now. The zero loading meant games like Worms Armageddon played a lot better on it too. My 'beef' with the controller i've explained in the earlier post i made, but then if i tried playing PS1 Alien Res.with the dual shock pad, i'd hate it as it so needs the PS mouse (and i so wish it had come to DC with keyboard and mouse support). Even know with PS3 pads, Sony's sticks still have issues with the dead zone, so really hoping PS4 does away with the dual shock design or at least over hauls it to point where the flaws are adressed. Huge Rayman 2 fan, but own/only played the DC version, did hear N64 version was gorgeous though. Weetrix? i was going to try on DC (Weetrix+) but ended up buying Aqua Aqua as it's known on PS2, there the PS2 controller ruins game for myself, found myself fighting with controls, very frustrating when your in a rush to place items.Hope the controls on N64 version work better. Zero loading? indeed things like Resident Evil 0 started off on N64, designed with 2 character swaps in mind thanks to no loading times, but it and Eternal Darkness switched to Gamecube development as N64 fortunes faded. I also got an N64 just because I wanted to play Goldeneye. I was not disappointed and it was all up hill from there. Was thinking about Goldeneye this morning. It really was and remains a superb game. Little things like the opening with the spinning logo into the 007 theme. The guns and levels are just awesome. Love the fact you can shoot body parts and enemies react suitably. pics of my N64 games - why not? Not quite up to date. Sold a couple of these privately to a PAL collector (Rat Attack, Lode runner 64 and the Waiailae Golf if I remember right - no great loss) I have a few others missing from these pics - Mario Party 2 and a few others. I also foolishly sold my original 64 to buy GC software. Had about 25 games with highlights including Mario 64, Goldeneye, Zelda OOT, Zelda MM, Mystical Ninja, Banjo Kazooie and Silicon Valley.